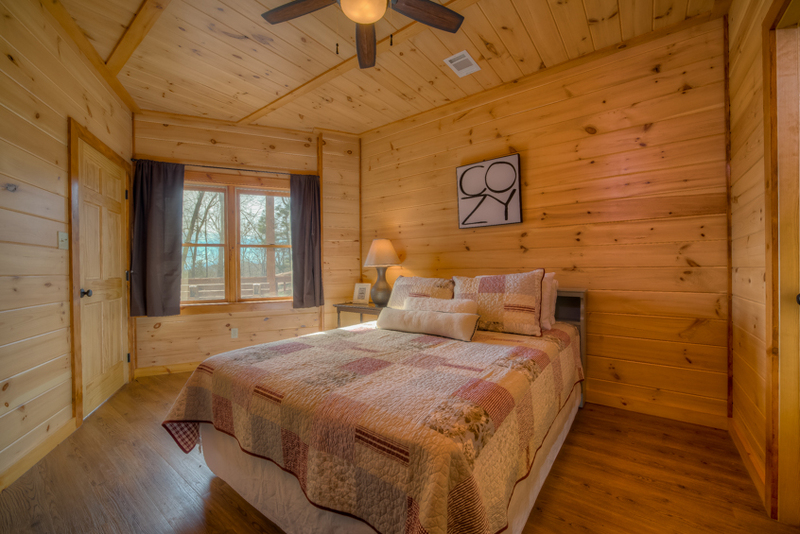 If you have a large family or you’re vacationing with a large party, it can be a challenge to find the right Blue Ridge GA cabin rental that’s spacious enough for all of you. 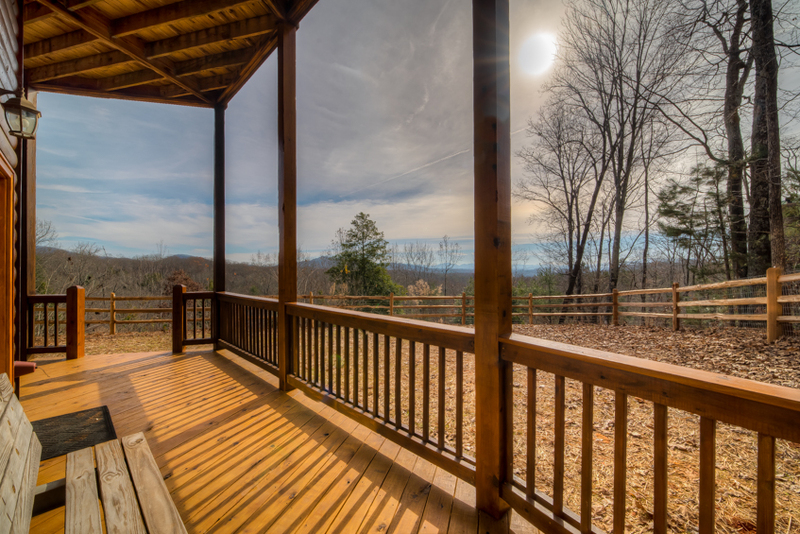 But if you’re looking for space, all the amenities you crave and a magnificent mountain view, look no further than Green Pine Cabin. 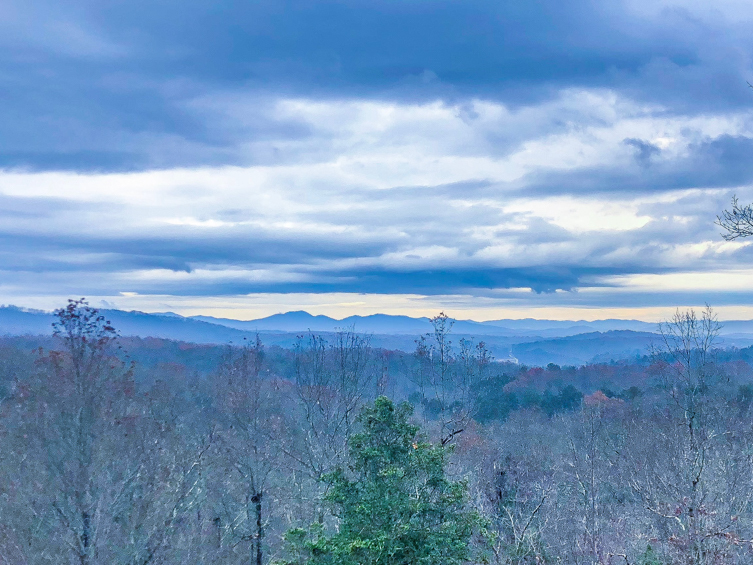 Located in Mineral Bluff, less than 15 miles from downtown Blue Ridge, this magnificent vacation retreat can accommodate 11 guests in comfort and style. 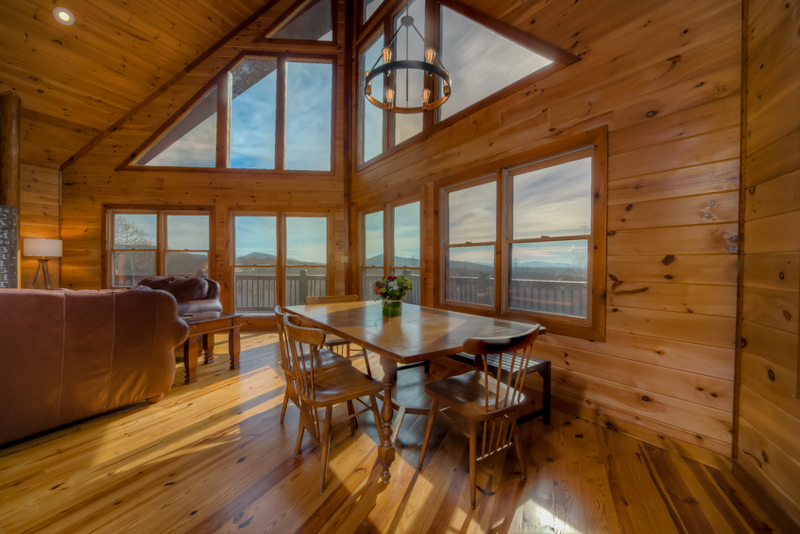 Constructed entirely of Georgia pine with a ship’s prow roof over a wall of windows that maximize the breathtaking view, the home is a private oasis in a beautiful natural setting. 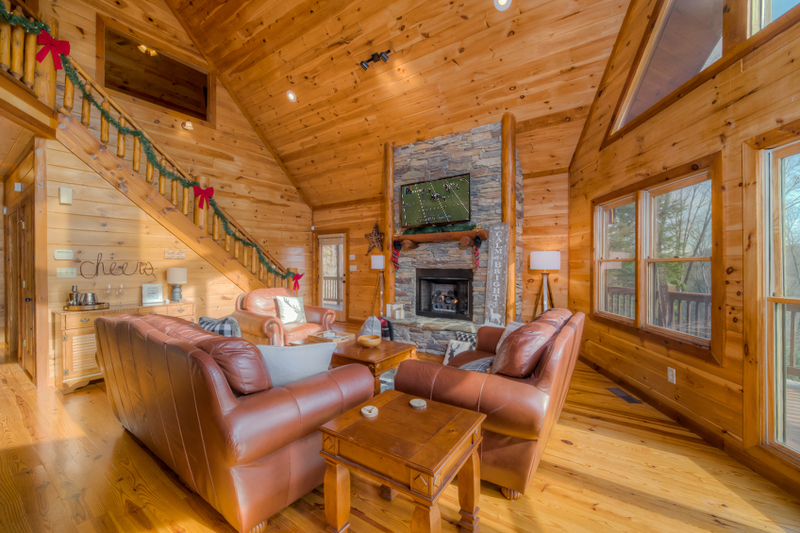 The main level great room is the heart of the home, with sumptuous leather furniture, a floor-to-ceiling gas stone fireplace, and a 55” Smart TV with DISH Network. The spacious kitchen is designed to please the most demanding cooks, as it’s well equipped with everything you need to prepare meals and entertain a crowd. 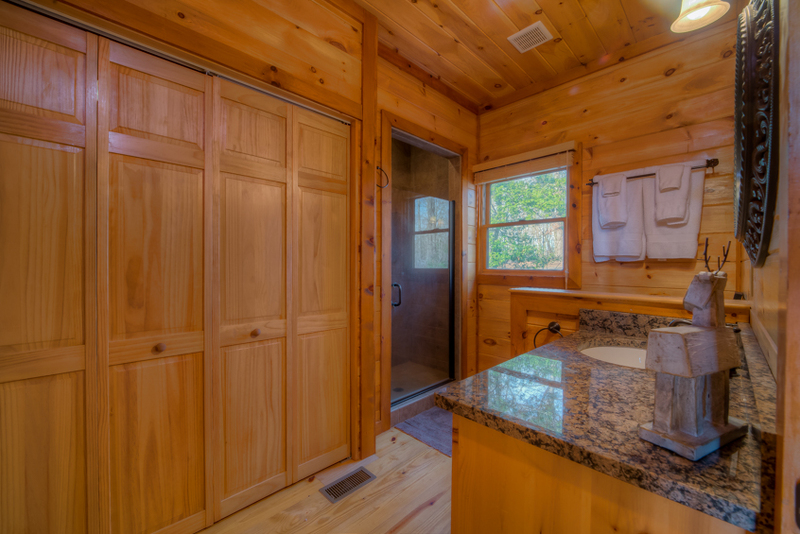 It features pine cabinets, granite countertops, stainless steel gas stove/oven, dishwasher, refrigerator with icemaker, a crockpot, and waffle maker. Coffee connoisseurs welcome: we have you covered with a coffeemaker, Keurig, and French press. There’s seating for eight to ten at the custom seven-foot dining table plus three at the breakfast bar (extra stools are available). 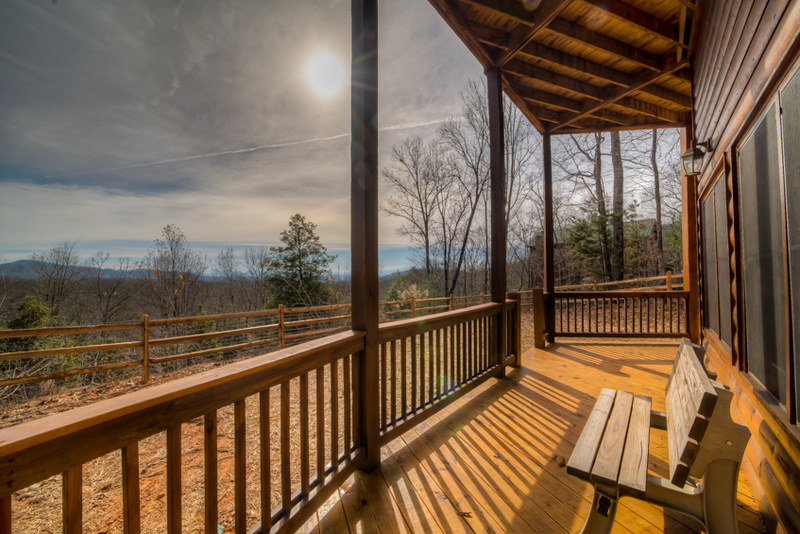 If you’d rather relax al fresco, there’s a gas grill on the main deck, where you can throw a log on the wood-burning fireplace and enjoy the fresh mountain air while feasting on your favorite barbecue. 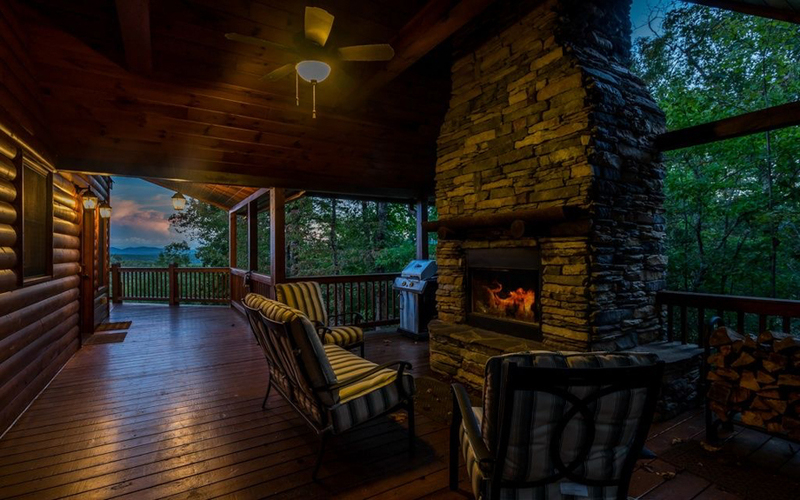 Cozy up on the handmade Adirondack chairs around the fire pit and toast some s’mores or enjoy a soothing soak under the stars in the hot tub. 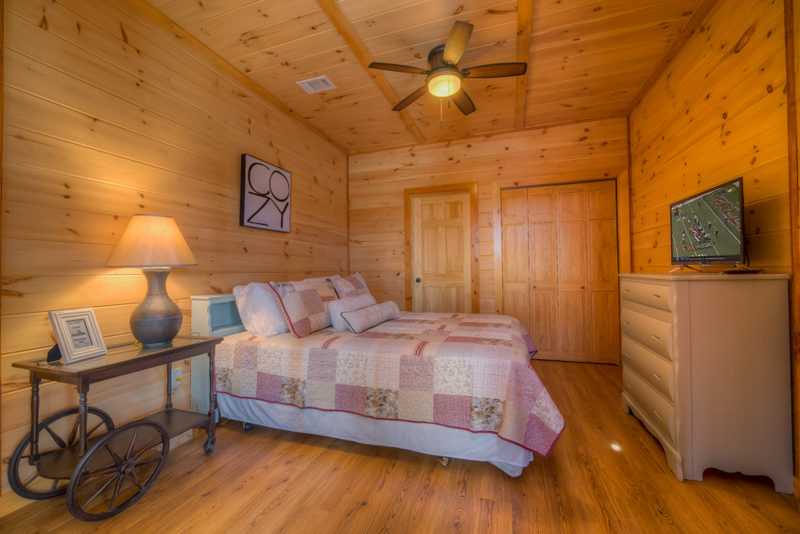 Its four bedrooms are designed for comfort, with luxury bedding, soft and fluffy quilts and blankets, and plenty of pillows. 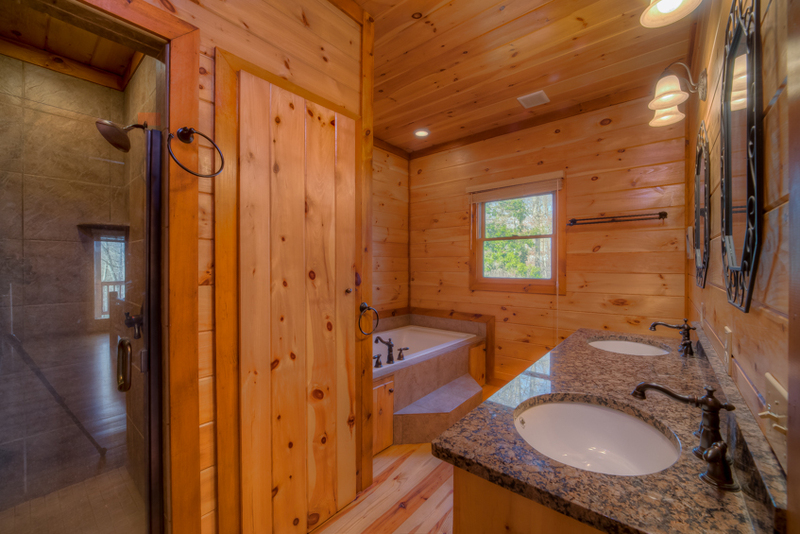 The upstairs master suite features a king bed, private balcony, and private bath with Jacuzzi tub, tiled shower, granite countertops, and double vanity. 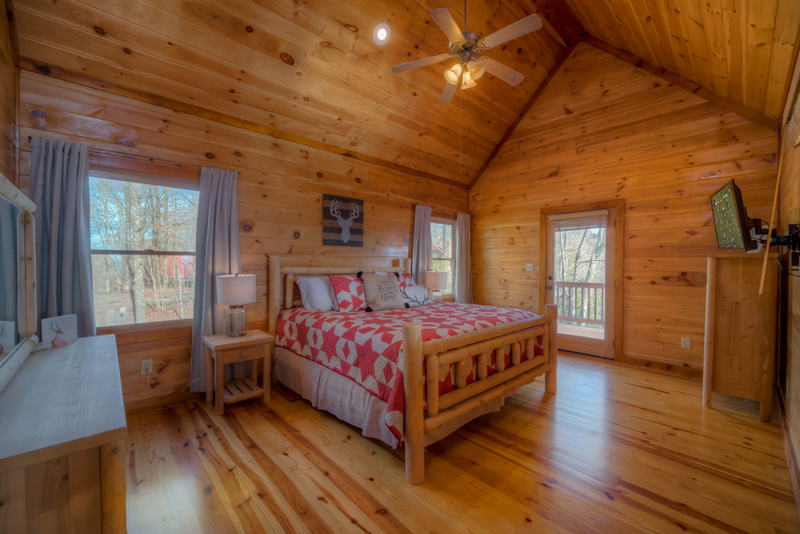 The main level bedroom has a king bed, deck access, and a separate bath with a walk-in shower. 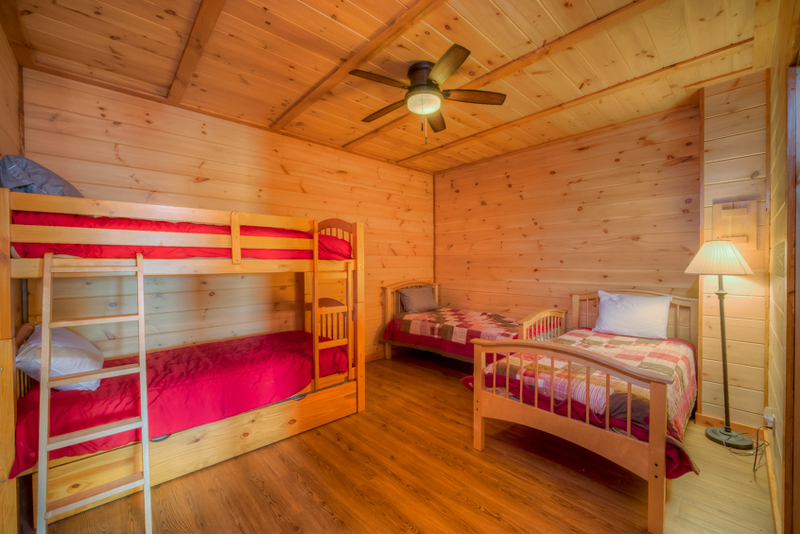 There’s a downstairs bath shared by two bedrooms, one with a queen bed and the other with a pair of twin beds and a twin bunk bed with trundle, perfect for kids. 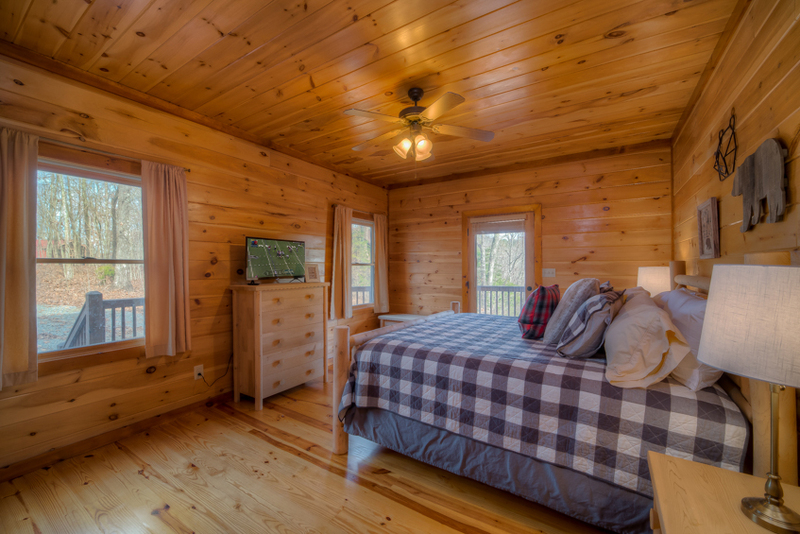 Each bedroom has a 32” smart TV with access to Netflix, Vudu, Hulu and Sling available with your own login. 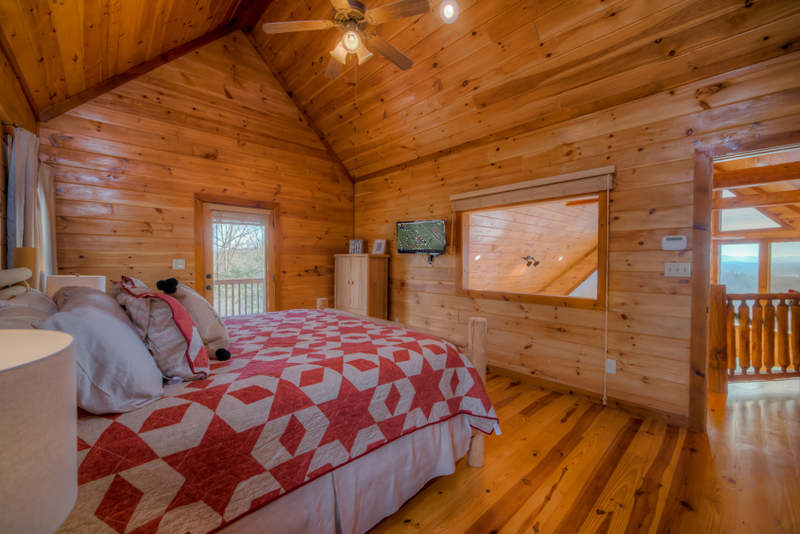 Green Pine Cabin has other notable features and amenities, including a downstairs den with a reclining couch and a 55” smart TV, a washer/dryer in the main level bath, ceiling fans throughout, a fenced yard with a double-wide gate, and a gravel driveway. And you don’t have to leave your furry friends at home. You can bring up to two dogs with you to enjoy a special family vacation that will leave you feeling relaxed, rejuvenated, and revived. 03/19 - I enjoyed the view and the set up of the house, it was very pretty. Everyone was very professional and even the property manager who told us that the hot tub could not be improved was very professional and informative. 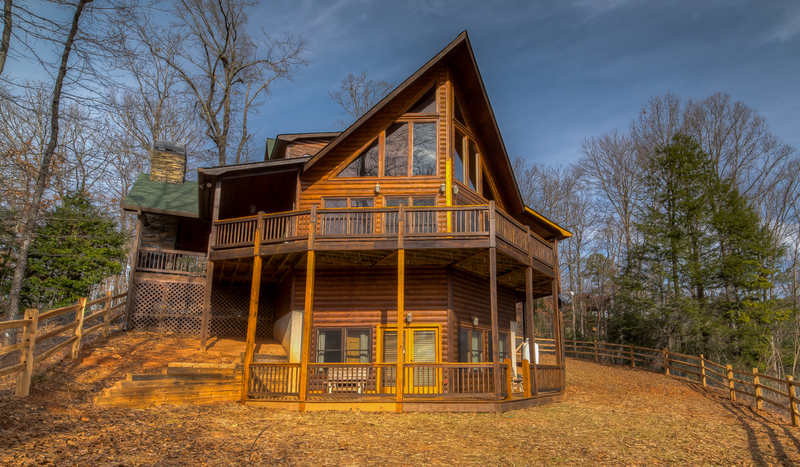 01/19 - Our weekend at Green Pine Cabin was amazing! We had a group of 7 adults and had plenty of space with room to spare. From lounging in the hot tub, to sitting by the fire pit, to acting like children playing Wii in the downstairs entertainment room, we couldn’t have asked for a more relaxing weekend. The location was perfect to go into downtown McCaysville/Copper Hill and even downtown Blue Ridge. If you enjoy great craft beer, we highly recommend Grumpy Old Men Brewing in Blue Ridge. 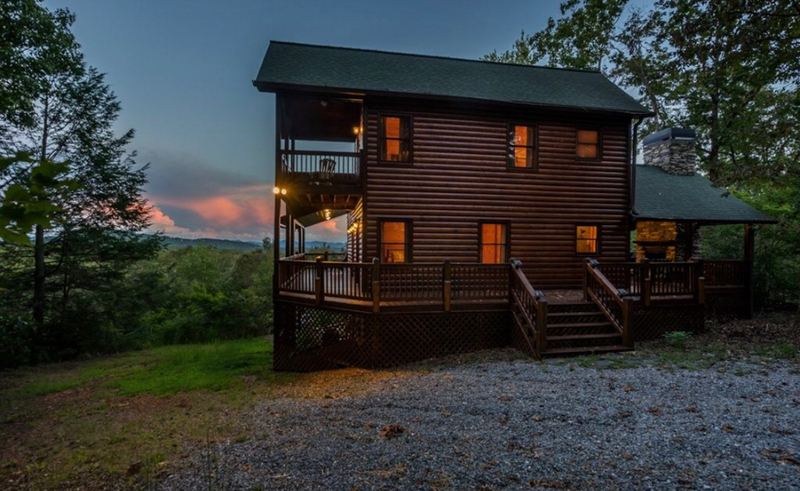 This cabin has everything you could wish for in a getaway! 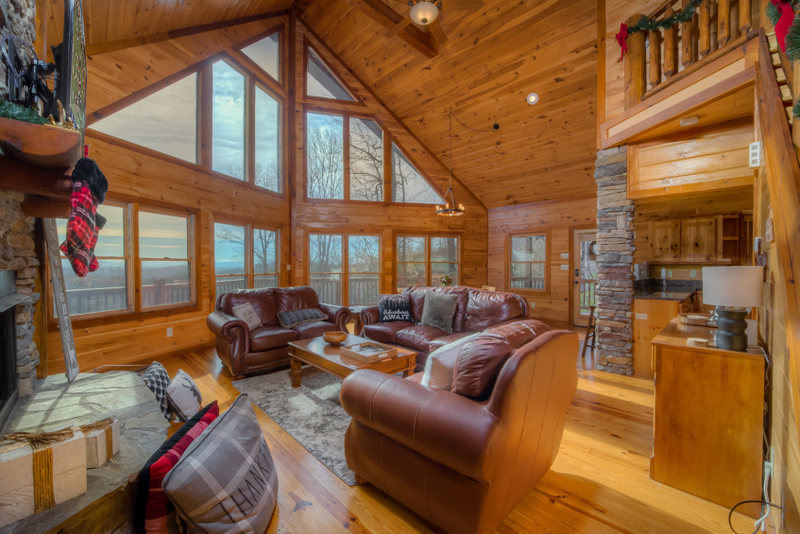 01/19 - Beautiful cabin. Nice quiet location. I have always had a great experience with this company! 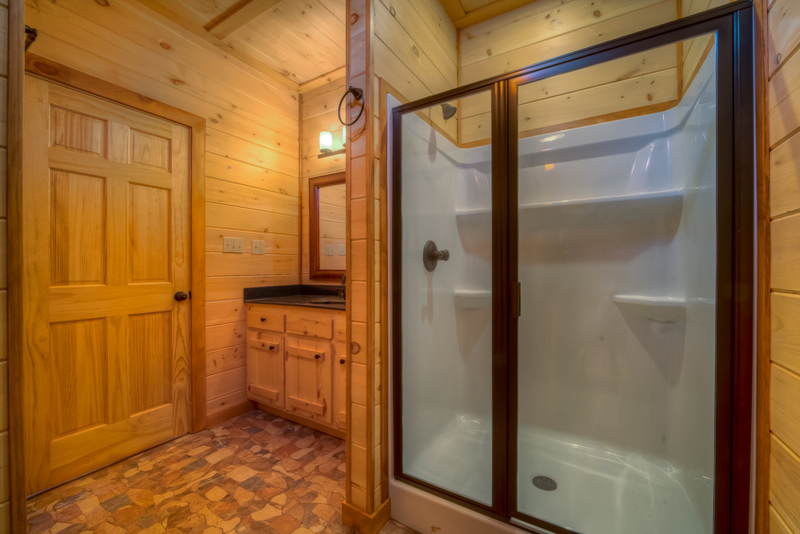 01/19 - Green Pine Cabin is perfection! My husband and I visited in early January with our 8 week old son and some friends. 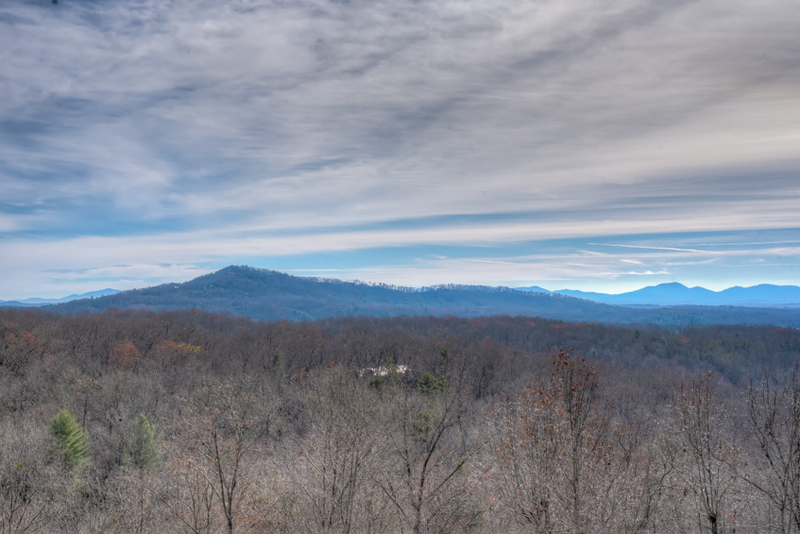 It is a short drive from the Atlanta area making it the ideal location for a weekend getaway. 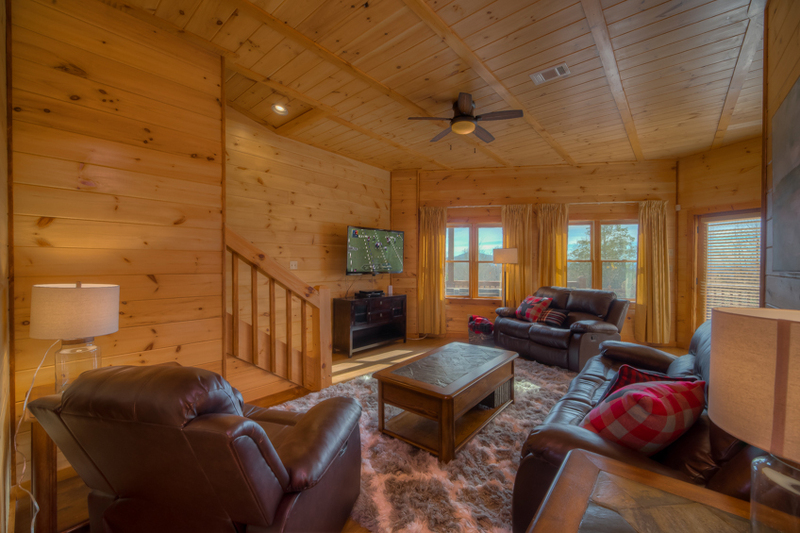 The cabin included everything on your wishlist for a mountain break - incredible views, beautiful sunrises, comfortable beds, and cozy indoor and outdoor fireplaces. Plus, who doesn’t love roasting marshmallows on a crisp Winter evening by a fire under a blanket of stars? It is also just a few minutes from the Tennessee border. The border town is a charming pitstop for a small bite and a beer at the local brewery. 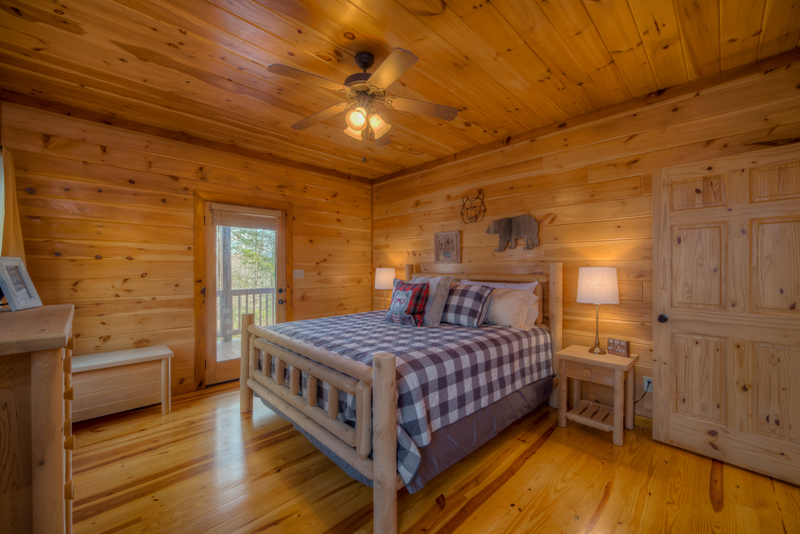 I highly recommend Green Pine Cabin for your next mountain stay. We cannot wait to go back! 01/19 - This cabin is awesome! The kitchen is fully stocked for meal prep; the bedrooms are roomy and comfortable with wonderful linens. 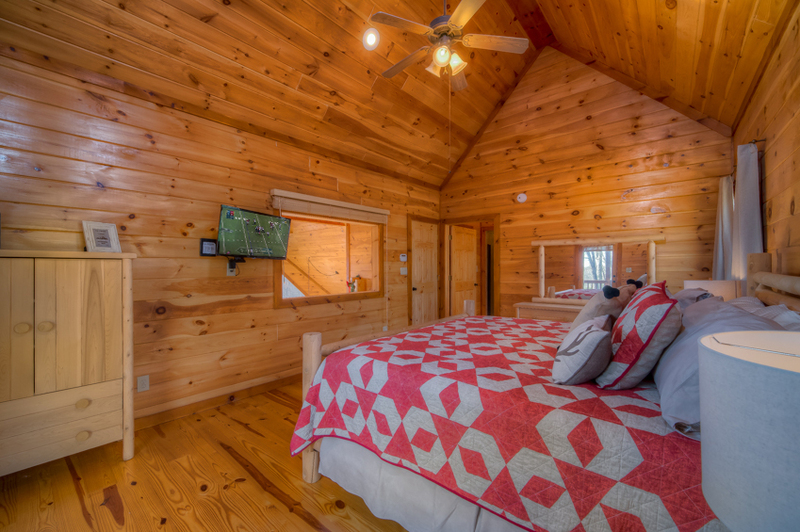 Three full bathrooms, two rooms for lounging, and plenty of televisions for watching games or movies make this escape ideal! Well done! 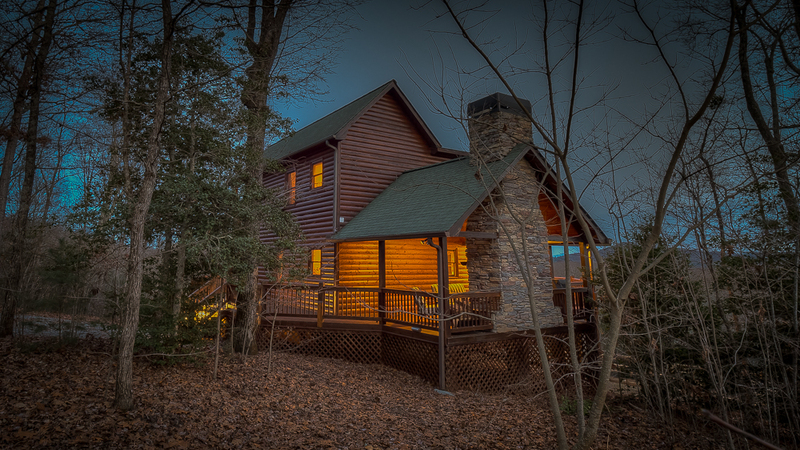 01/19 - We had the most amazing getaway at this cabin over December. Full disclosure - as someone who suffers from extreme motion sickness, I was so pleased at how easy the drive was from Atlanta. Just two hours, a few turns and you suddenly feel as though you're immersed in the great outdoors and all of its splendor. My husband and I have been through mountain excursions before where by the time we reached our destination I was so sick, I couldn't enjoy the experience. This was not bad at all! The drive in was so easy. There are views on views on views. As two working professionals who are always on the go, it was hard NOT to relax while we were there. The views were stunning and so relaxing. We also took advantage of the outdoor fireplace, right off the kitchen. 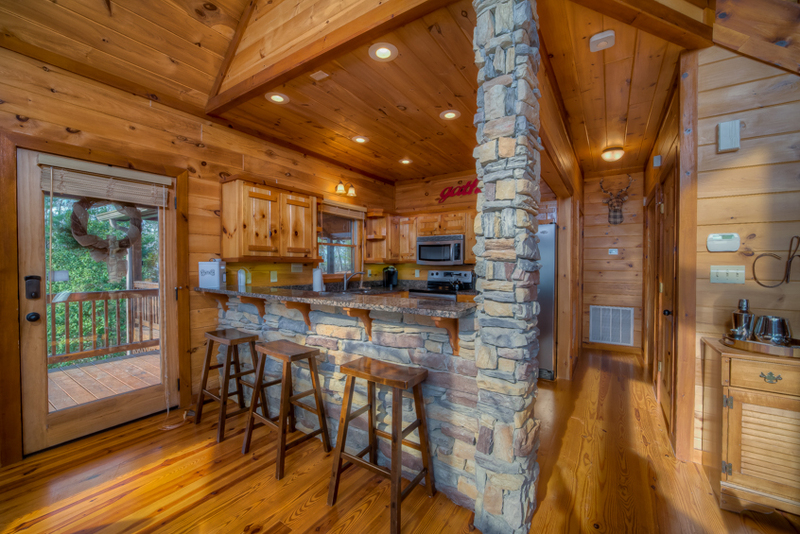 Unlike other cabins we've visited in North GA, this cabin actually invited us to cook with its lovely kitchen. It had everything we needed to make lunch, dinner and breakfast the next morning. There was nothing we needed that we didn't find. We went up with the intention of staying in and all of the fully stocked kitchen essentials made that possible. 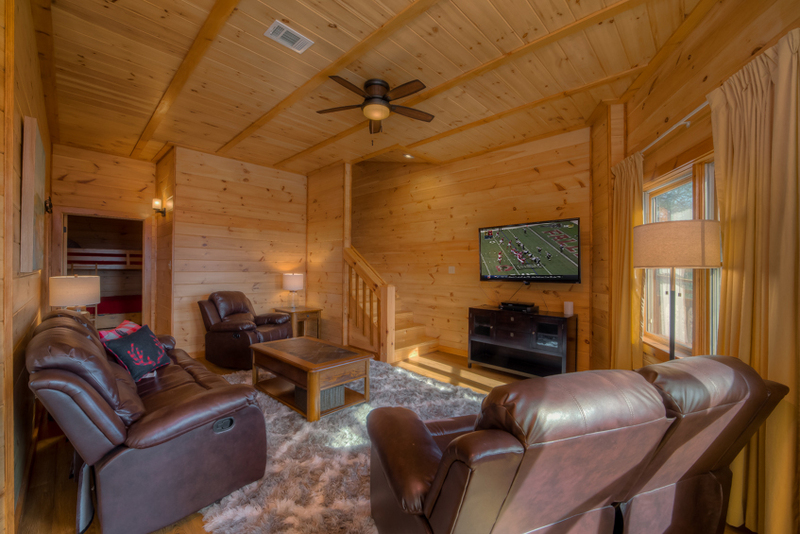 Also, the large TV in the living area made it easy to catch up on college football! The cabin was extremely clean. I originally thought it was brand new, but found out it was built a few years back. Not only was it spotless, the water pressure and temperature was amazing! I took a very long (and hot) shower and never lost pressure or temperature. We didn't need the washer/dryer or the additional rooms, but it was nice to know they were there. We mainly took advantage of the fireplace (both inside and out), the kitchen and the wonderful scenery. 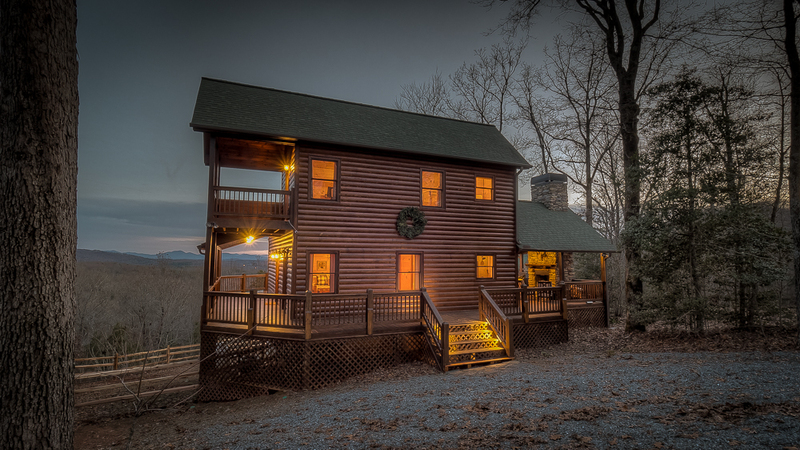 Overall, I would definitely recommend this cabin and plan to return! 02/19 - From the minute you pulled up to the cabin, you knew you were home. 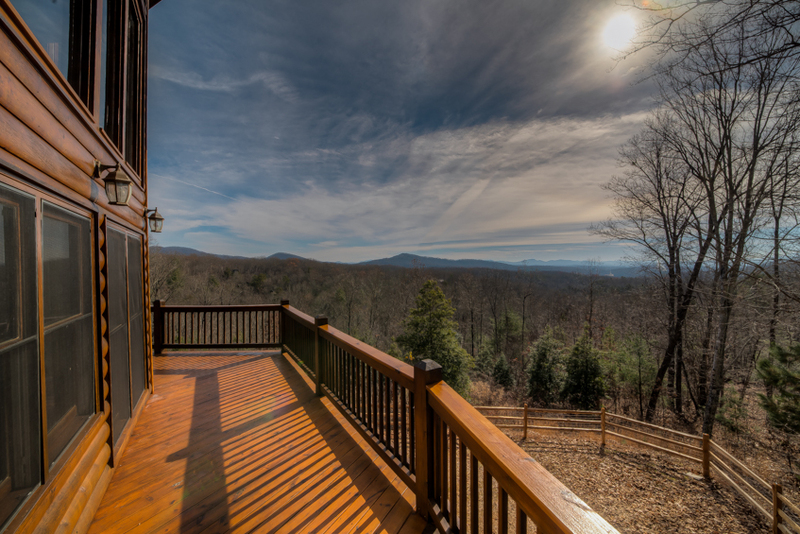 The incredible wrap around porch with outdoor fireplace welcomed us to the breathtaking views of the Blue Ridge Mountains. Every room had a view and every piece of furniture and bedding had the highest quality. 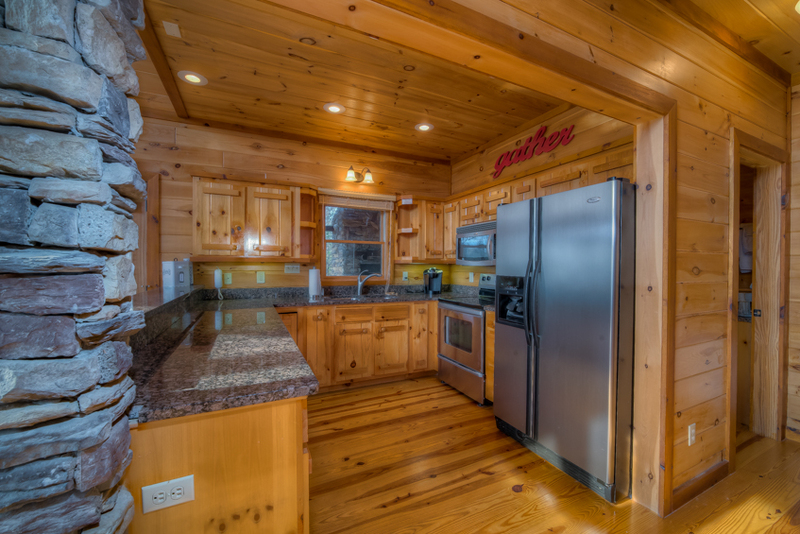 The kitchen was fully equipped with all the things you would need for an overnight stay or longer retreat from the hustle of city life. We are already planning a longer weekend with the kids. I loved the personal service I received making our reservation!